Have you ever wondered what makes a woman choose one engagement ring style over another? In every young girl’s dreams, a handsome knight in shining armor gets down on his knees and says, “Darling, will you marry me?”. While he holds out his love offering in an expensive- looking velvet box we can’t help but wonder what kind of precious goody it contains. Every princess has her preference; especially for a ring she is supposed to wear forever. For many women, an engagement ring can only be one thing; a large solitaire stone with four prongs; the larger the carat weight, the better. Yes, that is a wonderful choice. Whatever gem you choose for your special ring will be cherished and adored for symbolizing eternal love. What cut and shape will you choose? The way a stone is cut allows it to reflect light, exhibit fire and thrill us with those amazing flashes of color that only a well cut gemstone can produce. Nothing says love like an engagement ring that shimmers in the light. Whether you choose genuine diamonds or a top-grade Cubic Zirconia, you will naturally gravitate to certain shapes over others. Your favorites reflect your personality. How Do You Like Your Gemstones Shaped? Round – Usually with 57 facets, this is the most popular and traditional cut. Perhaps a little conservative, this is a wonderful choice for the person who enjoys wearing classic styles. Simple and elegant never goes out of style. Princess – This is second in popularity to the round shape, and is either square or oblong in shape. The cut of a Princess stone brings out its inherent sparkle. This is often chosen by extroverted women who love to dazzle and be dazzled. Emerald – This cut, in contrast, is an oblong with long, rather sparse lines. The stone is cut to show its clarity, rather than its brilliance. Because there is no place to hide when it comes to the clarity of the gem with an emerald cut, it is often one of the most expensive options. This shape attracts the cool, classically-beautiful and confident woman. Asscher – This shape was created over a hundred years ago and fell out of fashion. It has had a recent surge in popularity. The cut is reminiscent of a square emerald, and has a delightful Art Deco feel. 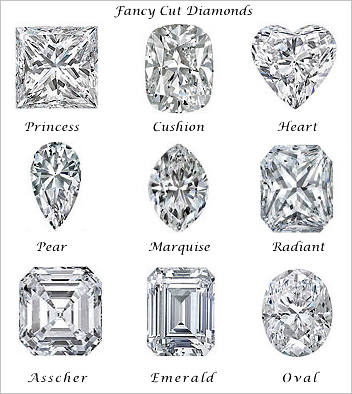 Asscher cuts are often chosen by women who love vintage clothes and shabby chic. Pillow – Sometimes known as the Cushion, this is a rather soft and sentimental square cut. It is pretty and dainty with its corners rounded to make the stone look truly brilliant. This is often the choice of women who like a certain retro look and who love to be surrounded by antiques. Marquise – Dramatic and elegant this oval shape is pointed at each end. The shape is marvelous for women with long tapered fingers. A very bold choice, you need to have real confidence to carry off this unique shape. Pear – The teardrop shaped pear stone is for the woman who likes something a little unusual. Sometimes people feel it is just a bit too reminiscent of a tear to be suitable for an engagement ring, others just love the shape and enjoy owning something really different. Oval – Another classic shape that is very flattering to all fingers. Ovals are known to make your hand look long and slender. The cut generally focuses on sparkle. This is a good choice if you want to be slightly, but not too, unconventional. Heart – Frequently chosen as a colored diamond, this is a lovely interpretation, especially for very young girls. Heart shapes are the perfect romantic choice. Many people choose to have a multi stone setting with an eye-catching solitaire center gem accompanied by smaller stones either set around it or inlaid along the band. This kind of setting is perfect if you want to feature colored stones such as sapphires, rubies and emeralds, but have the glamor of diamonds too. Many people will recall Princess Diana’s famous oval sapphire surrounded by diamonds. For a while it seemed that everyone had that style of engagement ring. Choosing a colored stone is another way that a woman can make a statement. A colored stone is a little less conventional, and is generally chosen because of a deep affinity with a certain color range. For example, Diana’s sapphire echoed her beautiful blue eyes. If you think that wearing a pink diamond engagement ring or a blend of chocolate diamonds and yellow topaz sounds fascinating, you are a trend setter extraordinaire. The question of a raised setting or a flat setting is important. 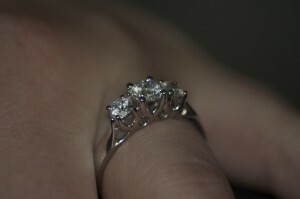 A raised setting makes a stone look bigger and allows it to catch and reflect the most light. Lots of light refraction means lots of gorgeous dazzle and glitter. Of course, it is much more vulnerable to being knocked and damaged. For the active person, it may even get in the way. If you plan on wearing your engagement ring only on special occasions, then a raised setting is a good choice. If you prefer to wear your ring all the time, then a flat setting, although less spectacular, is a safer bet. Dare we say, there is even an argument for having two complementary engagement rings, one for day to day wearing, and one for dress up occasions. Some unconventional girls won’t even have an engagement ring, but under every hippy lurks a princess. If you want to select an engagement ring which is completely different, then choose an antique piece, or have something especially designed just for you. Select semi precious stones like topaz and amethyst, even garnet, amber or turquoise can look stunning in the right setting. It’s important not to rush into the choice of a ring. Of course, if the proposal is a surprise, then your man may have already selected one for you. If you don’t like his choice, then you are going to have to find a tactful way of saying so, or live with the ugly thing on your hand forever. If you think a marriage proposal is heading your way, it never hurts to start hinting about the types of designs that you really admire.